This content was published: September 22, 2011. Phone numbers, email addresses, and other information may have changed. Portland Community College has 50,000 reasons why its new school year, which starts on Monday, Sept. 26, will be one to remember. The college is celebrating its 50th Anniversary with a kick-off celebration from 11:30 a.m. to 1 p.m., Friday, Oct. 7 in Pioneer Courthouse Square (701 S.W. 6th Ave). The program will feature entertainment and music, interactive exhibits from PCC programs, and refreshments from local businesses. 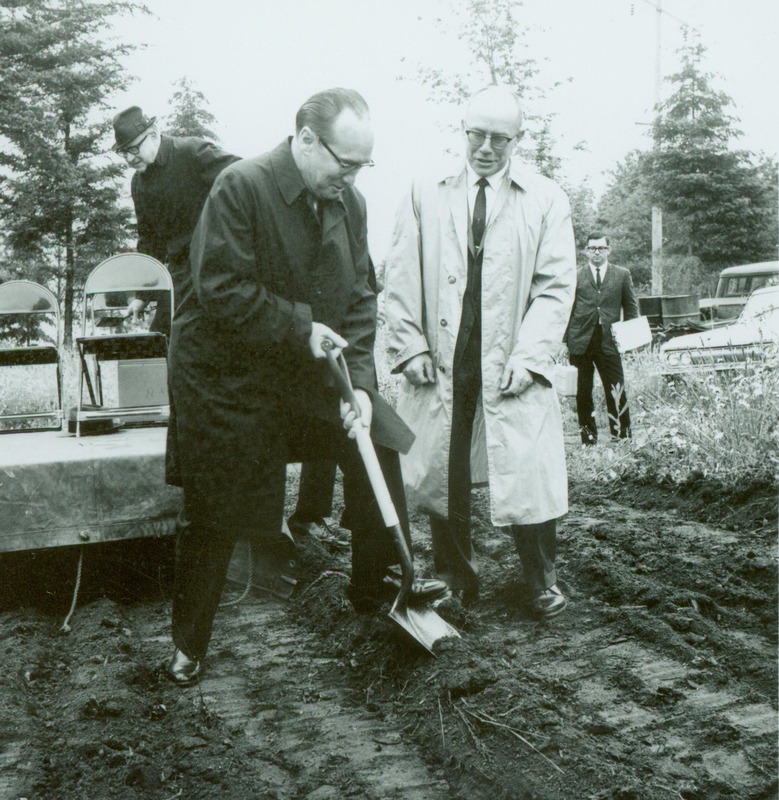 PCC's founding President, Dr. Amo De Bernardis (right), breaks ground with the Board of Directors at Mount Sylvania in 1966. This was the start of construction of the Sylvania Campus in S.W. Portland. In honor of PCC’s 50th anniversary, the college has pledged to donate 50,000 hours of service to the community. The college will kick-off this effort at its staff and faculty In-Service on Monday, Sept. 19, at the Sylvania Campus (12000 S.W. 49th Ave.) where they will volunteer time, and their books, to benefit the Children’s Book Bank, which distributes books to low-income children. In addition to this project, PCC will partner with local community service efforts throughout the year to achieve its 50,000-hour goal, which means PCC will double or triple the number of projects and hours it usually organizes in one year. When Oregon’s Legislature approved the formation of community colleges in 1961, the Portland Public Schools launched PCC, which was its adult vocational program at the time. And in 1962, the program took over PPS’s unused Failing Elementary School in S.W. Portland and soon after was renamed Portland Community College. The Failing school had been closed down and the building abandoned. Located at 049 Southwest Porter Street near the west end of the Ross Island Bridge, it was a central location for the fast-growing community college. Mayor Sam Adams (right) greets PCC's first Future Connect scholars at City Hall. Thanks to a partnership between PCC and the City of Portland, Future Connect is a new initiative that helps at-risk students in Multnomah County who face barriers in going to college yet have the potential to succeed. To eliminate the barriers, Future Connect scholarship recipients can attend PCC while being provided with on-going support such as scholarship money, career guidance and personal advising. Ninety-five percent of the first Future Connect scholars are first-generation college students. With support from the City of Portland and donations to the PCC Foundation, 200 students have receives scholarship support for this fall. This fall a new era begins for PCC’s Cascade Campus and Jefferson High School. The Middle College partnership between PCC and Portland Public Schools — which enables students from Jefferson to take college credit classes at Cascade — will enroll more students than ever before. Every incoming Jefferson freshman will be a Middle College student as the high school transforms to become Jefferson High School: Middle College for Advanced Studies. Until now, the program has operated on an opt-in basis. Freshmen in the Jefferson neighborhood will enroll in Middle College or attend another nearby comprehensive high school. 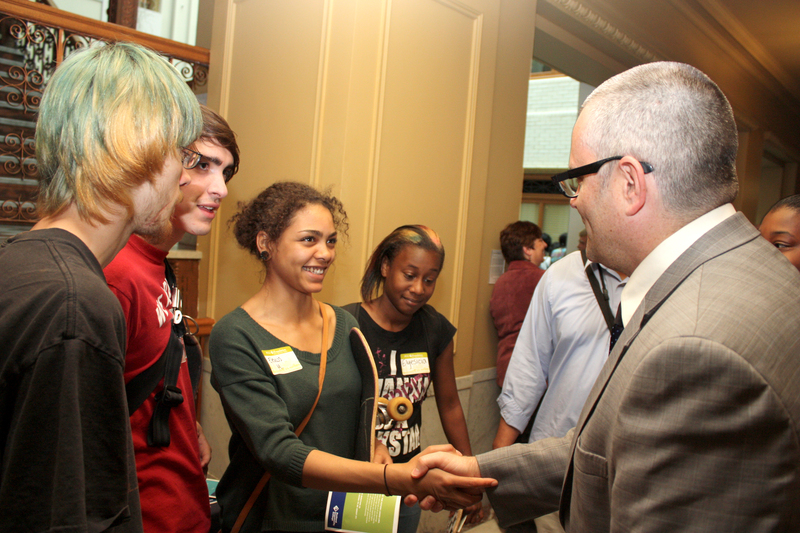 Students from other PPS high schools also will be able to transfer to Jefferson. 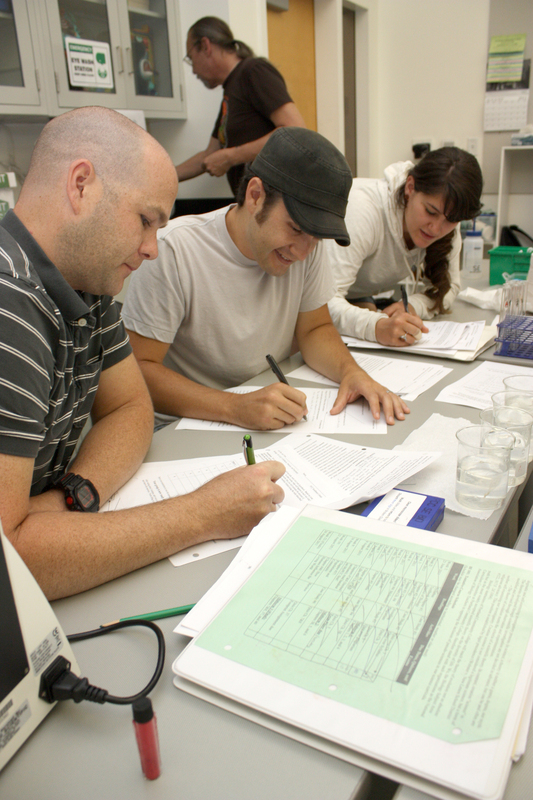 Since 2007, Middle College students have passed 87 percent of their college credit classes. Ninety-nine percent of program participants have successfully completed high school, and of these, 72 percent have continued their college studies. “Expanding Middle College to every student is the kind of thing that can change this neighborhood for generations,” said Middle College Coordinator Damon Hickok. Biology students, left to right, John McCall, Mike Kempf and Kara Srnka are happy to have gotten into one of the Southeast Center's biology classes, which have long wait lists. straight term. PCC grew by one percent in headcount to 25,488 this term and by one percent for full-time equivalent (FTE) students to 4,047. By campus: Rock Creek (17705 N.W. Springville Road) is up 11.4 percent in headcount and grew by 9.9 percent in FTE; Sylvania (12000 S.W. 49th Ave.) is down 1.2 percent in total headcount and up 0.3 percent in FTE; and Cascade (705 N. Killingsworth St.) is up 1.1 percent in headcount and down 3.9 percent in FTE. Southeast Center, which opened in 2004, has experienced the most rapid enrollment growth of any PCC location. In data released by PCC’s Office of Institutional Effectiveness for the last three years, the center has grown to 6,175 credit students this year from 4,705 in 2008 – an increase of 31 percent. In response to the crowding issue, the PCC Bond Program soon will start work on expanding the two-building Southeast Center to make it a full-service comprehensive campus – the fourth one in the PCC district. Currently, the center has 26 classrooms and the bond will double the space devoted to classrooms, labs, study space, gathering areas and library. PCC plans to begin construction of the $39 million expansion project during the spring of 2012. This fall, PCC’s also plans to open its first center in Newberg. It’s on target to becoming a Net Zero facility, using 80-percent less energy than standard academic buildings in the nation.